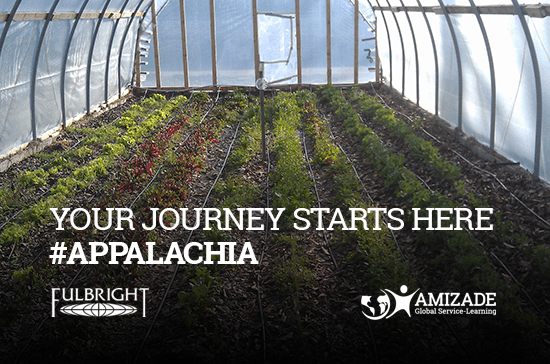 New partnership between The Fulbright Program and Amizade to engage 12 Fulbrighters in Appalachia. In March 2016, the U.S. Department of State Bureau of Educational and Cultural Affairs will sponsor six Fulbright Foreign Student Program students and six Fulbright U.S. Student Program alumni to participate in a week-long service-learning program led by Amizade in Williamson, WV. The Fulbright Program is the flagship international educational exchange program sponsored by the U.S. government. Fulbright enrichment activities are designed to support the overall mission of the Fulbright Program – to increase mutual understanding between the people of the United States and the people of other countries. Amizade, through its partnership with Sustainable Williamson in the Appalachia region, will offer Fulbright participants a number of enriching service opportunities throughout the week relating to education, agricultural and economic sustainability, community health and the discovery of how these community components are interrelated. Amizade is very excited to work with the Fulbright Program because of the international perspective provided by the Fulbright participants. Amizade values active social agents who are channeling their knowledge of Americana through Appalachia, a significant touchstone for the United States. During their week-long program in Williamson, Fulbrighters will be participating in service activities and learning about the town and its history. Williamson is a small rural coal-mining town in Mingo County (WV) that once was home to 50,000 residents and a thriving coal economy in the mid-20th century. However, in recent years, Williamson has experienced a collapsed coal mining industry, a series of devastating floods, and de-population. Now a population of 3,000, community members have joined together to create Sustainable Williamson, the local organization with whom Fulbright students and alumni will be working. Sustainable Williamson is a small team of community organizations that work together to increase access to fresh foods, initiate active living programs, and teach healthy living styles. Throughout the week, the Fulbrighters will be sharing in and learning how community members are pioneering and engaging in thoughtful work in order to maintain their cultural framework while also creating a realm of new opportunities. The Fulbright participants were selected for this opportunity from the thousands of foreign Fulbrighters studying in the United States because of their understanding of service learning and the shared impact of their actions with the community, both key facets of Amizade’s approach to locally-led community service. The Fulbrighters selected for this experience will use social media platforms such as Twitter, Facebook, and blog posts to capture their experiences in Appalachia for a virtual audience. Amizade strives to collaborate with other organizations, institutions, and associations to spread the ideal to stimulate ethical conversation and commitment across the sector. Amizade is excited to share the news of the Fulbright Program and Amizade partnership. Throughout this experience, Amizade and the participating Fulbrighters will be documenting how this experience furthers Amizade’s mission to empower individuals and communities through worldwide service and learning, through blog posts and video features by Amizade and Fulbrighters – stay tuned!